As part of a pioneering clinical trial, Jared Ausnehmer had millions of stem cells injected into his heart to help treat a debilitating heart condition. That treatment has opened the door to renewed health for Jared. Halloween is an especially meaningful day for Jared Ausnehmer and his family. On Oct. 31, 2011, Jared's family saw a news story about a man who had had stem cells injected into his heart to reverse damage from a heart attack. Jared's mom, Patty Ausnehmer, wondered if this type of treatment could help her son, who was born with hypoplastic left heart syndrome — a birth defect in which the left side of the heart is underdeveloped or nonexistent. The news story kicked off a search for answers that led Jared and Patty to Mayo Clinic's Rochester campus, where he participated in an innovative clinical trial. The trial paved the way for Jared to have successful heart surgery. As a result, Jared is no longer weighed down by his heart condition, and he's returned to the athletic activities he enjoys. "Mayo Clinic is an amazing place. They care, and they know what they're doing," Jared says. "I'm most grateful that I'm not sick anymore and everything went well. You can't take that for granted." A rare congenital heart disease, hypoplastic left heart syndrome affects only about 1,000 newborns in the U.S. each year. Jared received a variety of treatments, including multiple surgeries during his first year of life and medications to improve his heart function. Still, by the time Jared reached his early 20s, his heart was enlarged and its neoaortic valve was leaking badly. "I just didn't feel well. I was tired all the time and was retaining a lot of fluid," says Jared, who went from playing basketball and softball, and running track in the Special Olympics, to lying on the couch all day. Eager for a new treatment option, Patty called the hospital that was mentioned on the news. Unfortunately, they weren't doing stem cell therapy for Jared's condition. But she didn't stop there. The story spurred Patty to learn more about the possibility of stem cell therapy for hypoplastic left heart syndrome. In the course of her research, Patty found Mayo Clinic's Center for Regenerative Medicine and had a phone consult with Tim Nelson, M.D., Ph.D., a Mayo Clinic physician and researcher whose work focuses on congenital heart disease. Dr. Nelson told Patty that Mayo Clinic was starting stem cell therapy for infants with hypoplastic left heart syndrome but not for young adults like Jared. "I explained our mission and desire to design such a trial in the future," Dr. Nelson says. Although treatment with stem cells wasn't an option at that time, Jared and his family learned that through Mayo Clinic's Todd and Karen Wanek Family Program for Hypoplastic Left Heart Syndrome, he could participate in another study and receive care from Mayo Clinic doctors with years of experience in treating the condition until a stem cell clinical trial became available. When Jared and Patty came to Mayo Clinic in April 2012, Jared's condition had deteriorated to the point that he had to carry an oxygen tank with him to breathe, and his abdomen was swollen with retained fluid. "He had cardiac cirrhosis, and his kidneys were starting to fail," Patty says. "If he didn't improve, he would need a heart, kidney and liver transplant." The doctors found Jared was too ill to undergo valve replacement surgery. Instead, they suggested a more intense medication program to help him better tolerate the effects of the leaky valve and possibly regain some of his heart function. Over the next few weeks, pediatric cardiologist Patrick O'Leary, M.D., increased the dosage of one of Jared's heart medicines, restarted another and added a new medication. "The goal was to help Jared's heart muscle cope with the extra work load it was facing — pumping blood to his body rather than to the lungs and also pumping much more blood per minute due to the leaky valve," Dr. O'Leary says. "Jared improved almost immediately and surprisingly continued to improve with each medication adjustment." "You have this feeling of 'My gosh, I'm finally in the right place.' I saw people that care and were moving mountains for my child," Patty says. With the improvement, Jared was able to return home, where he received care from a local cardiologist in Youngstown, Ohio, who was in frequent communication with the Mayo Clinic doctors. In October of the following year, Jared returned for follow-up tests at Mayo Clinic. The results showed that his ejection fraction, a measurement of the percentage of blood leaving the heart each time it contracts, had increased from 15 to 30 percent. "The really remarkable thing was how much he changed in terms of his heart's day-to-day function. Normally under these conditions, the right ventricle's muscle would wear out," Dr. O'Leary says. "The turnaround he achieved with medications — from crippling heart failure to being an active healthy appearing young adult — is something I have only encountered in his case." Dr. Nelson told the Ausnehmers that he was trying to secure permission from the Food and Drug Administration to use bone-marrow-derived stem cells for young adults with hypoplastic left heart syndrome. "We were in the process of creating something that had not been created before," Dr. Nelson says. "The idea behind this study was to use the stem cells as 'fertilizer' for the heart muscle to stimulate the heart to grow bigger and stronger, and undergo a regenerative process that would improve heart function." Unfortunately, in the spring of 2014, Jared was admitted to the intensive care unit at a local hospital. "He was dehydrated, and his kidneys were not working," Patty says. "They gave him liquids and took him off the heart medications and one of his diuretics. He started feeling better." After being discharged, Jared started being monitored by a local nephrologist. His kidney function improved as the family waited for the stem cell therapy trial to begin. "Heart transplantation is usually the only option in these circumstances, but for Jared even that was not a good choice," Dr. O'Leary says. "His body was already sensitized to many human proteins from his past treatments, making rejection of a transplanted organ very likely." "Jared's heart was working twice as hard, and there was no way for him to continue to have the kind of life we wanted him to have without the stem cell treatment," Patty says. "We knew his heart was going to fail, but we didn't know when. Still we were optimistic." On Halloween weekend in 2015, the family got the call they been waiting for since 2012. Dr. O'Leary said they were ready to begin the stem cell clinical trial and wanted Jared to be the first of 10 participants. On Dec. 16, 2015, in the first clinical trial of its kind, Jared had 94 million stem cells from his own bone marrow injected into his right ventricle through a heart catheterization. The results were significant. Within a month, Jared's ejection fraction increased to 40 percent. "Jared had a very remarkable response to this stem cell therapy," says Yasir Qureshi, M.B.B.S., lead investigator for the clinical trial. "While we predicted increased heart function, Jared has surpassed all expectations." "He had this second wind he hadn't had in a long time," Patty says. "He seemed like he was so much better in every way." By August 2016, Jared's heart was strong enough to undergo open heart surgery to replace his leaky valve. Cardiothoracic surgeon Joseph Dearani, M.D., did the valve replacement on Aug. 24 and placed a pacemaker in Jared's abdomen. "Jared had a very remarkable response to this stem cell therapy. While we predicted increased heart function, Jared has surpassed all expectations." — Yasir Qureshi, M.B.B.S. 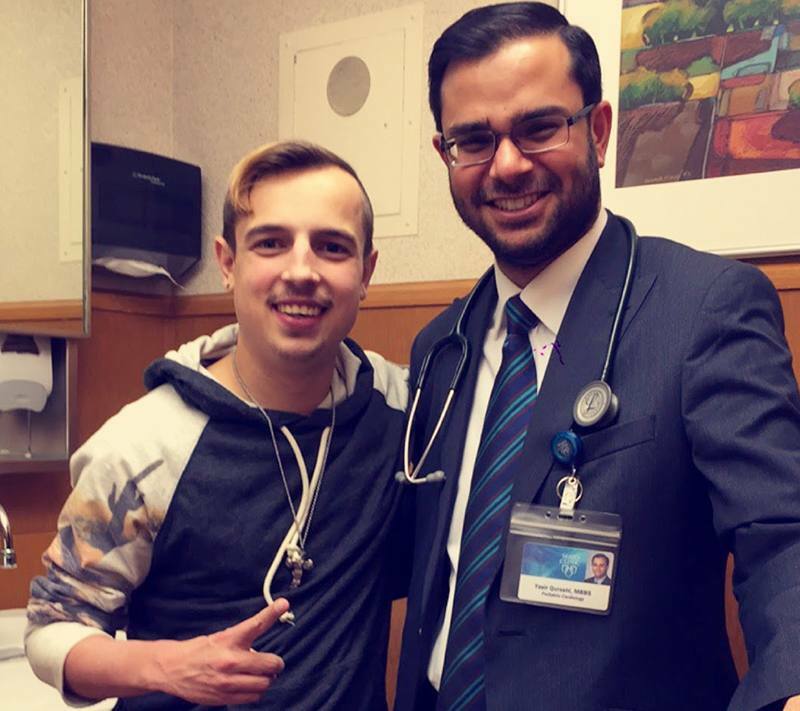 "It's common for patients that have a Fontan circulation like Jared to have a slow heart rate," Dr. Dearani says. "We put a pacemaker in to ensure the heart has the ability to slow down and speed up depending on his activity level." "With the new mechanical valve, his endurance was way up. It was like a new lease on life," Patty says. After eight days in the hospital, Jared headed home to get back to normal life. Two months after his surgery, he was cleared to play basketball. "I'm relieved that it's all done. That's the best part," Jared says. "My goal was to get to basketball and compete at state." Jared has follow-up appointments every six months, but he hasn't experienced any significant problems, and he's back to athletic competition. Six months after the valve replacement, Jared won first place in the running long jump and got third place in the 100-yard dash at the Special Olympics. "Short of contact sports, he can do anything he wants to do and move toward achieving his goals and aspirations," Dr. Dearani says. "It's a great feeling to know I was able to make a difference in what his quality of life could be." "Jared is doing fantastic. He's our inspiration to keep moving forward with what we're doing." — Tim Nelson, M.D., Ph.D.
"For him to do what he wants to do is amazing," Patty says. "He can now get married and have kids and make a life for himself without this hanging over him anymore." The clinical trial is slated to be completed by the end of 2017. Dr. Nelson and his entire team are grateful for the trust everyone who is part of the study has placed in them. "The pioneering spirit of these patients and their families to be the first ones to do this is inspirational, and we take that very seriously. It's like a sacred bond," Dr. Nelson says. "Jared is doing fantastic. He's our inspiration to keep moving forward with what we're doing." Learn more about hypoplastic left heart syndrome. Connect with others talking about Hypoplastic Left Heart Syndrome on Mayo Clinic Connect. Dr.Nelson is such a great, caring man! Cindy C.